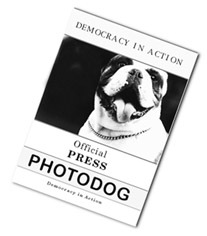 Copyright © 2006, 2007, 2008 Eric M. Appleman/Democracy in Action. Dec. 29, 2006-Beyond the Beltway-Former Sen. John Edwards holds a town hall meeting in Portsmouth, NH as part of his announcement tour. Dec. 19, 2006-Draft Obama holds a fundraiser at Local 16 bar. Dec. 8, 2006-Former Sen. John Edwards receives a Paul Wellstone Award from the AFL-CIO. Dec. 8, 2006-Gov. Bill Richardson (D-NM) was one of several governors to speak at an event organized by the Apollo Alliance. Dec. 6, 2006-Gov. Mike Huckabee (R-AR) honored as the "Role Model of the Year" by Jobs for Americas Graduates (JAG). Dec. 6, 2006-Gov. Bill Richardson (D-NM) and Gov. Tom Vilsack (D-IA) at Democratic Governors Association meeting. Dec. 3, 2006-Sen. Evan Bayh (D-IN) after an appearance on ABC News' "This Week." Nov. 29-30, 2006-Beyond the Beltway-Gov. Tom Vilsack (D-IA) announces his candidacy in Mount Pleasant, IA. Nov. 20, 2006-Sen. John McCain (R-AZ) after an appearance on ABC News' "This Week." Nov. 15, 2006-Former Sen. John Edwards discusses his new book "Home: The Blueprints of Our Lives" and signs copies. Nov. 15, 2006-Sen. Evan Bayh (D-IN) with the three newly elected congressmen from Indiana. Nov. 6, 2006-Former President Bill Clinton and others rally for U.S. Senate candidate Jim Webb at Market Square in Alexandria, VA.
Nov. 6, 2006-Former Vice President Al Gore rallies Maryland Democrats at Leisure World in Silver Spring, MD. Nov. 6, 2006-Sen. George Allen (R-VA) makes an early stop at the Vienna Metro Station in Vienna, VA.
Oct. 22, 2006-Sen. Barack Obama (D-IL) after an appearance on NBC News' "Meet the Press." Oct. 2, 2006-Sen. Chris Dodd (D-CT) addresses the Congressional Hispanic Caucus Institute's Public Policy Conference. Sept. 28, 2006-Sen. Hillary Rodham Clinton (D-NY) addresses the Women's Leadership Forum's 13th Annual National Issues Conference. Sept. 22-23, 2006-The Washington Briefing/2006 Values Voter Summit. Sept. 22, 2006-Republican presidential candidate John Cox unveils television spots. Sept. 21, 2006-Former Gov. Mark Warner helps Democratic U.S. Senate nominee Jim Webb raise money at the Torpedo Factory in Alexandria, VA.
Sept. 21, 2006-Senators Sam Brownback (R-KS), Russ Feingold (D-WI), Barack Obama (D-IL), Mike DeWine (R-OH) and Tom Coburn (R-OK) urge quick action on Darfur legislation. Sept. 21, 2006-Gov. Mitt Romney (R-MA) discusses health care reform in Massachusetts at a National Journal Policy Council forum. Sept. 11, 2006-Former Speaker Newt Gingrich speaks on "Lessons from the First Five Years of War: Where Do We Go from Here?" at the American Enterprise Institute. Sept. 7, 2006-Sen. Joe Biden (D-DE) delivers a speech on "Five Years After 9/11: Rethinking America's Future Security." Aug. 2006-Beyond the Beltway-DNC meeting in Chicago. Aug. 2006-Beyond the Beltway-Presidential prospects visit the Iowa State Fair. Aug. 7, 2006-Gov. George Pataki (R-NY) delivers a major policy speech on energy at the National Press Club. July 31, 2006-Former Speaker Newt Gingrich addresses Young America's Foundation Student Conference. July 28, 2006-Sen. Chuck Hagel (R-NE) speaks on U.S. foreign policy in the Middle East at The Brookings Institution. July 27, 2006-Congressional Democrats rally for "A New Direction;" Republican Mainstreet Partnership promotes "Promise for America." July 22, 2006-DNC Rules and Bylaws Committee votes to recommend Nevada and South Carolina as new early 2008 states. July 19-20, 2006-NAACP 97th Annual Convention. July 19, 2006-Gov. Tom Vilsack (D-IA), Sen. Hillary Rodham Clinton (D-NY) and others announce college proposal as part of "American Dream Initiative." July 17, 2006-Sen. Evan Bayh (D-IN) calls for a renewed focus on the American middle class in a speech at the National Press Club. July 16, 2006, (b)-Sen. Joe Biden (D-DE) and former Speaker Newt Gingrich after an appearance on NBC News' "Meet the Press." July 9, 2006-Sen. Chris Dodd (D-CT) speaks to reporters after an appearance on CBS News' "Face the Nation." June 30, 2006-Former Sen. Tom Daschle participates in "Ceasefire on Health Care" at the National Alliance on Mental Illness' 2006 Annual Convention. June 22-23, 2006-NDN 2006 Annual Meeting. June 22, 2006-Former Sen. John Edwards delivers major speech on poverty at the National Press Club. June 21, 2006-Former Speaker Newt Gingrich at NFIB luncheon. June 20, 2006-Sen. George Allen (D-VA) addresses the Edison Electric Institute's Annual Convention/Expo. June 16, 2006-Sen. Hillary Rodham Clinton (D-NY) delivers a major policy speech on privacy rights at the American Constitution Society for Law and Policy Convention. June 12-14, 2006-Campaign for America's Future's "Take Back America" Conference. June 11, 2006-Rep. Tom Reynolds (R-NY), chair of the National Republican Congressional Committee, talks with reporters after an appearance on ABC News' "This Week." May 25, 2006-Sen. George Allen (R-VA) and Senate Majority Leader Bill Frist (R-TN) participate in Alliance for Marriage's press conference in support of the Marriage Protection Amendment. May 23, 2006-Sen. Hillary Rodham Clinton (D-NY) delivers a major energy policy speech at the National Press Club. May 19, 2006-Sen. Russ Feingold (D-WI) speaks at the Center for Strategic & International Studies. May 17, 2006-President George W. Bush addresses the Republican National Committee's Presidential Gala. May 17, 2006-Sen. Sam Brownback (R-KS) and various congressmen speak in support of plug-in hybrid vehicles. May 16, 2006-Former Sen. John Edwards and former HUD Secretary Jack Kemp launch a partnership to encourage corporations to offer automatic 401(k) and IRA options to their employees, at the Costco in Arlington, VA.
April 26, 2006-Former Speaker Newt Gingrich speaks on immigration at the American Enterprise Institute. April 17, 2006-Former Sen. Mike Gravel announces his campaign for President of the United States. April 16, 2006-Sen. George Allen (R-VA) speaks to reporters after an appearance on CBS News' "Face the Nation." April 10, 2006-Rally for immigration reform. April 6, 2006-Former Sen. John Edwards rallies for the Fair Minimum Wage Act with Sen. Edward Kennedy and citizens. April 5, 2006-Sen. John McCain (R-AZ) speaking upon release of Citizens Against Government Waste's "Pig Book." April 4, 2006-Sen. Sam Brownback (R-KS) and Sen. John McCain (R-AZ)at the United States Hispanic Chamber of Commerce's 16th Annual Legislative Conference. April 2, 2006-Sen. George Allen (R-VA) speaks to reporters after an appearance on ABC News' "This Week." March 28, 2006-Illinois businessman John Cox, a Republican candidate for president in 2008, at Vision America's "The War on Christians" conference. March 20, 2006-International Association of Fire Fighters' Legislative Conference draws Sen. Joe Biden (D-DE), Gov. Bill Richardson (D-NM), Sen. Chuck Hagel (R-NE), and the national party chairs. March 19, 2006-Sen. Chuck Hagel (R-NE) speaks to reporters after an appearance on ABC News' "This Week." March 12, 2006-Sen. Russ Feingold (D-WI) speaks to reporters after an appearance on ABC News' "This Week." March 11, 2006-DNC Rules and Bylaws Committee considers Report and Recommendations of the Commission on Presidential Nomination Timing and Schedule. Feb. 28, 2006-Gov. Tom Vilsack (D-IA) speaks at the National Press Club. Feb. 25-28, 2006-National Governors Association Healthy America Forum and Winter Meeting. Feb. 28, 2006-Senate Majority Leader Bill Frist (R-TN) addresses the Credit Union National Association's 2006 Governmental Affairs Conference. Feb. 9-11, 2006-33rd Annual Conservative Political Action Conference. Feb. 8, 2006-Rep. Tom Tancredo (R-CO) addresses rally on immigration. Feb. 7, 2006-Gen. Wesley Clark (ret.) helps launch Palgrave Macmillan's "Great Generals" series. Jan. 30, 2006-Senate Majority Leader Bill Frist (R-TN) speaks at a College Republicans' "Support Our Troops" rally. Jan. 25, 2006-Sen. Hillary Rodham Clinton (D-NY) addresses a U.S. Conference of Mayors luncheon. Jan. 24, 2006-Gov. Ed Rendell (D-PA) releases Democratic Governors Association's "America Competes" plan. Jan. 20, 2006-Republican National Committee Winter Meeting. Jan. 16, 2006-Former Vice President Al Gore warns "America's Constitution is in grave danger" in a speech at Constitution Hall. Jan. 5, 2006-Press conferences for confirmation of Judge Samuel Alito. Jan. 4, 2006-Press conferences against confirmation of Judge Samuel Alito.